Surbiton is in Zone 6 on the main line from Waterloo to Guildford, Basingstoke and Portsmouth so the trains are frequent. Journey times from Waterloo range from 17 minutes (fast) to 25 minutes (stopping). Exit the south side (back) of the station (to your right at the top of the stairs from the platform) and on leaving the station proceed straight ahead up South Bank to the Ewell Road (A240). Turn right and head south along this road for about half a mile until just before the traffic lighted junction as the road flattens out at the foot of the hill. Turn left here into Hollyfield Road, at the end of which cross King Charles Road into Alexandra Drive opposite. The Club is about 250m down this road on the right hand side. 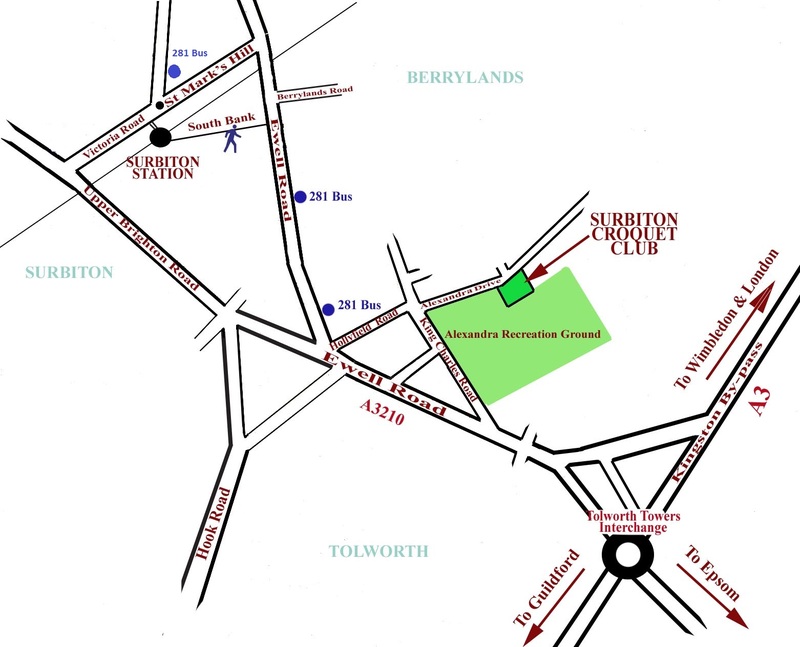 281 services leave from opposite Waitrose (across the road from Surbiton station’s main entrance); alight at the Hollyfield Road stop, just a five minute walk from the Club (see map for details). There is a taxi rank in the station forecourt. The club is about one and a half miles from the station. From the A3: leave the A3 at the Tolworth/A240 junction (NB: there is no eastbound exit at the Hook/A243 junction) and proceed north along Tolworth Broadway. Turn right opposite Budgen's supermarket (just under half a mile from the A3) and then left into King Charles Road. Alexandra Drive is the first turning on the right (about 400m, next to a small children’s playground). The Club is about 250m along Alexandra Drive on the right. From the north: pass through Surbiton on the A240 and turn left just before the Royal Oak traffic lights (about ¾ mile from the bridge over the railway) into Hollyfield Road and proceed as for ‘by foot’ above.